Culms: Erect, evergreen, unbranched or irregularly branched when older, .2 to .75 inch in diameter, hollow, jointed, ridged; ridges with silica deposits. Leaves: Inconspicuous, reduced to small tooth-like scales fused together in a cylindrical sheath at each node. Sheaths: Flattened or flared at the top, .2 to .75 inch long, green when young, developing dark brown or black ring, portion above the ring becoming tan, white, or grayish; teeth numerous, persistent or shed, lanceolate, less than .2 inch long, firm and stiff to thin and paper-like, twisted, blackish, margins colorless, tips pointed. Inflorescences: Cones, solitary, sessile or short-stalked, ellipsoid, .2 to 1 inch long, terminal; tip ending in abrupt, flexible point; cone composed of spore-bearing bodies; spores numerous, minute, spherical. Habitat: Edges of streams and lakes, ditches, and woodlands; shaded or exposed moist soils. Toxicity: Scouring-rush can be toxic to cattle and horses but is rarely consumed. It can be a a problem when fed in hay. Uses: The stems contain silica. They were sometimes used to smooth items made of wood and bone, polish fingernails and arrow shafts, and scour pots and pans. 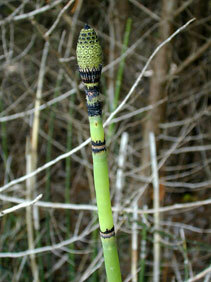 The hollow stems were also used as straws to give children medicine. Native Americans used scouring-rush medicinally. The Cheyenne and Blackfeet used it as a medicine for horses. Comments: Scouring-rush is rhizomatous and often grows in dense stands. The stems usually last more than one year.